The Sabot Auction was last night. I went with checkbook in hand, since Griff had participated in one of the art projects and I needed to be prepared to bid. 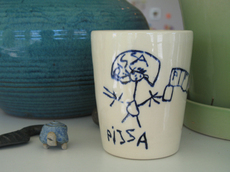 Well, bid I did, and I won the lot of cups etched with children's drawings. It was immediately apparent which of the cups was Griff's. Can you tell what aspects of the artwork tipped me off? 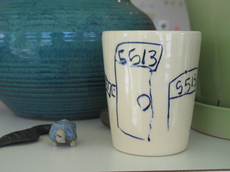 (1) It features a door and mailbox, both labeled "5513." (2) It also features a "pizza guy." The guy is calling out "pizza!" while holding a box labeled "pizza". The rest of the cups are going to the homes of the artists. This one will stay with us, if only to prevent the rest of the world from learning too much about our dinner habits. Griff is delighted to have it and immediately asked to drink tea from it.